Cozmo expresses real emotions in response to your actions. Unlike some other STEM-friendly robot kits, the Cozmo isn’t a thing you build or program (yet). It’s more of an AI work in progress and a demonstration of personality. And it’s definitely a toy you can play games with. 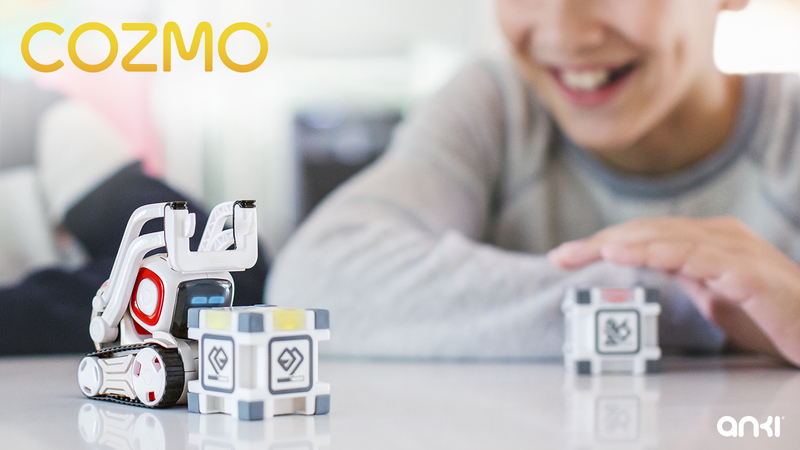 Cozmo will come with a set of sensor-embedded blocks that are used both to play games with the robot and to help it understand its position in the environment. More than 325 individual sensors, moving parts, and electrical components work together to deliver Cozmo’s range of emotions. Four motors, one per tread and two on either side of the robot’s lifting lever, supply Cozmo thrust. Motion-sensing gyroscopes and accelerometers help the bot detect when it’s being hoisted from the ground. The robot uses facial recognition technology powered by a camera where its mouth would be to remember different people, and its software will learn and adapt to you over time the more you play with it. With the tap of a smartphone screen, Cozmo comes to life. It makes a subtle motion to indicate it’s shaking off its slumber and begins wheeling over to the edge of the table. When it gets too close, it slams to a halt and looks down over the cliff, emitting a series of terrified chirps. When it wheels back and reorients itself, Cozmo takes a hard look at the other faces in the room. Some are new, but others it remembers from before it fell asleep. There’s the upcoming software development kit (SDK) to consider, of course. Cozmo launches with open programming hooks that’ll allow those with the technical know-how to extend the ‘bot’s capabilities far beyond those with which it ships. The robot is designed for ages eight and up and will sell for $180 in October, with pre-orders starting today.